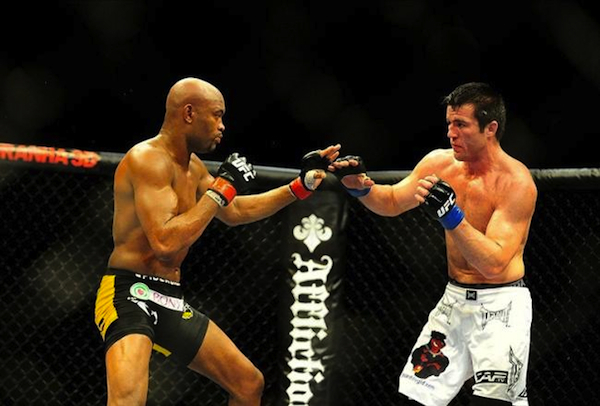 Will Anderson Silva be able to silence the trash-talking Chael Sonnen once and for all? The UFC/MMA world gets a fantastic treat on Saturday night, as UFC 148 is set to produce a handful of great and memorable fights from the MGM Grand Garden Arena in Las Vegas, Nevada. On top of everyone’s fight card will be two very closely watched battles, with the main event featuring a rematch between two of the toughest middleweights in the world, Anderson Silva and Chael Sonnen, and a nostalgic clash between Tito Ortiz and Forrest Griffin, in a send off of the 15-year octagon veteran Ortiz, who will make his final appearance in a professional bout this evening. With some calling this UFC night one of the biggest of the year, there’s no question we’re getting a piece of the action tonight for online sports betting at one of the top reviewed online sportsbooks found right here at CR. Sparks have already flown during the weigh-in for these two competitors, as Silva made it known with a shoulder shot to Sonnen’s jaw that this fight tonight means all-out war. These two fighters first clashed back in UFC 117, where Silva managed to produce a choke-out after struggling to contain Sonnen for 5 previous rounds, and heading into tonight’s featured showdown, there is plenty of bad blood and retribution lingering for Sonnen in particular. This match-up of fighters is perhaps one of the best ever to enter the octagon, as despite two very different fighting styles (Silva is a master of Muay Thai and Brazilian Jujitsu, Sonnen a wrestling specialist), the two are extremely well matched in terms of intensity, training, and stamina. As we saw in the first meeting between these two fighters, Sonnen is perfectly capable of standing toe-to-toe against Silva, winning the first four rounds of the UFC 117 bout, but he will have to find a way to use his wrestling expertise to get the better of ‘The Spider’ tonight, as Silva has plenty of poise and stamina to last throughout a long fight and wear down his opponents. You make one mistake with Silva and you’re done, so Sonnen will concentrate on avoiding the veteran striker’s quick shots, and look to get him down on the mat in later rounds. Silva on the other hand should be expected to stay coy, work the fight more like a boxing match, and wait for the right time to strike. You can rest assured Silva won’t look taken aback like he was in the first fight, and won’t be underestimating his loud-mouthed opponent in arguably one of the biggest career bouts for both fighters. There is perhaps one difference between these two fighters that stands out, and that’s in their methods for engaging a fight, and having respect for their opponents. Sonnen has publicly insulted Silva, his wife, and his country of Brazil. Silva has stayed the constant professional, even refusing the fight Sonnen due to his disrespectful nature. However, nothing shuts a flapping mouth up more than direct confrontation, and there will be no question that if Silva, tonight’s favorite at -290 odds to win straight up at Intertops sportsbook (vs. Sonnen at +220 odds), can beat down Sonnen, the case will be made that Silva is without question the best middleweight fighter ever to step in the octagon, and Sonnen will finally have his harsh words fall upon deaf ears. It’s a little bittersweet to see tonight mark the last fight in long and storied career of ‘The Huntington Beach Bad Boy’, as Tito Ortiz is set to retire after his third match-up against fellow former Light Heavyweight title holder Forrest Griffin. Perhaps retirement is even coming a little to late in the eyes most fight fans, with Ortiz struggling in the past 5 fights, posting a 1-4 record over the last few seasons. There was no question that in his prime, Ortiz would be the better of the two men in this match-up, as Forrest Griffin isn’t known for being a great toe-to-toe fighter, but now it appears that the younger, better trained Griffin has the opportunity tonight to send off a champion and 15-year octagon veteran into full-time daddy mode. Key for Ortiz, if he is to walk away a winner here this evening, is to avoid letting the fight go early. He’s got to be a risk taker, which may open himself up against a more agile and likely better conditioned fighter in Griffin, but without going for an early finish there is no doubt he won’t be able to handle a multi-round straight up brawl. Remember though, that Griffin hasn’t fought in nearly a year, coming back in the octagon after getting knocked-the-F-out by Mauricio Rua in UFC 134. While Ortiz is an underdog at -290 odds, his veteran skills could still find him getting one last haymaker in that sends him out of the UFC world in style. We can’t bet on that though, and expect Griffin to pull off a victory via overwhelming Ortiz with his better stamina and inability to play into Ortiz’s hands. Look for him to stay away from the wrestling game, leading to a decision in favor of Griffin tonight. Make sure to catch these two bouts, and a host of others on the UFC 148 fight card tonight from Las Vegas, as it’s certain to be one of the most exciting events on the UFC/MMA calendar this year!